Built in 1902 by D. J. Dunlop & Company, Glasgow. Commissioned 14 February 1904. Built to maintain the 1902 Trans Pacific Cable and owned by the Pacific Cable Board, which represented the Dominion governments, so she carried the prefix HMCS, (His/Her Majesty’s Cable Ship), the first to do so. Fitted with four cable tanks, two forward and two aft, combined paying out/picking up machine forward and a paying out machine aft, triple bow sheaves and single stern sheave. Transferred to Imperial & International Communications Ltd. in 1929 and renamed Recorder (2). 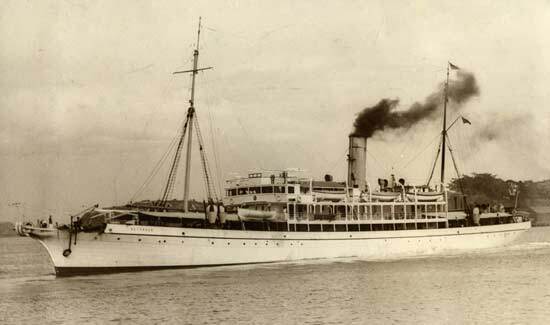 Based at Auckland until the outbreak of war and then transferred to Singapore. After the fall of Singapore moved to Gibraltar and then to Aden. Underwent an extensive refit in 1947 and was finally taken out of service in 1952 and sold for scrap. 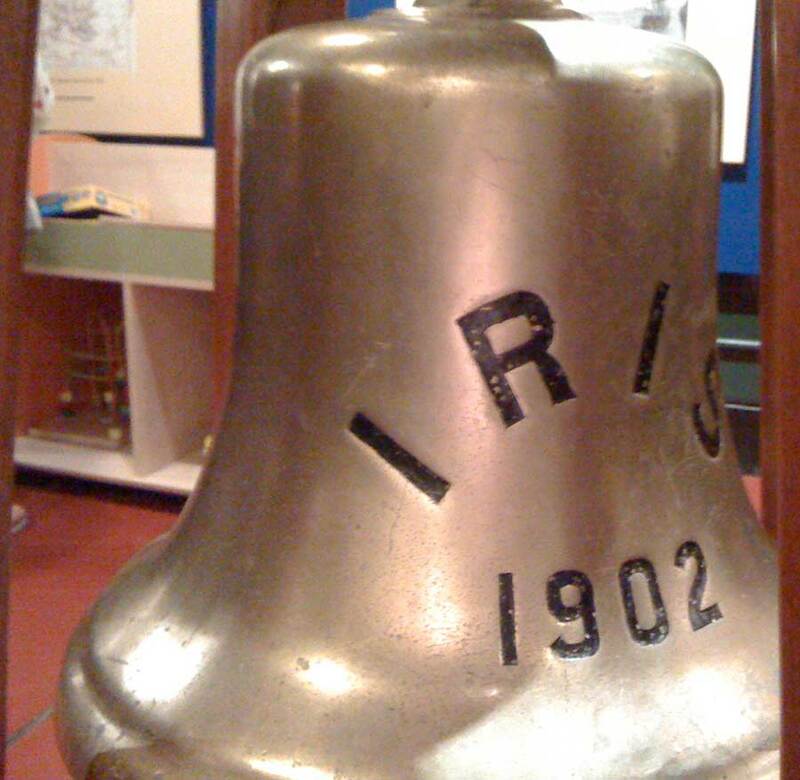 The bell from HMCS Iris (1) is now at the Porthcurno Telegraph Museum. 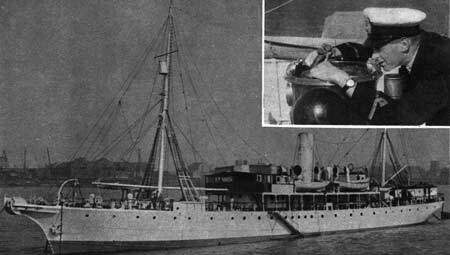 See also Peter Edwards’ page on CS Recorder (2), which details an incident in World War I when HMCS Iris (as the ship was then named) captured the crew of a German raider. The badge, buttons and cap tally shown below are those of H.R. (Harry) Hughes, who became Captain of HMCS Iris (1) in 1923. He served on the ship from its commissioning in 1904 until his retirement in 1931. Captain Hughes was aboard Iris at the time of the incident with the German raider noted above. His retirement was prompted by the sale of Iris to what would become Cable & Wireless following the 1929 amalgamation of the two services, which meant that the ship’s home port would no longer be in New Zealand, where he had lived for many years. 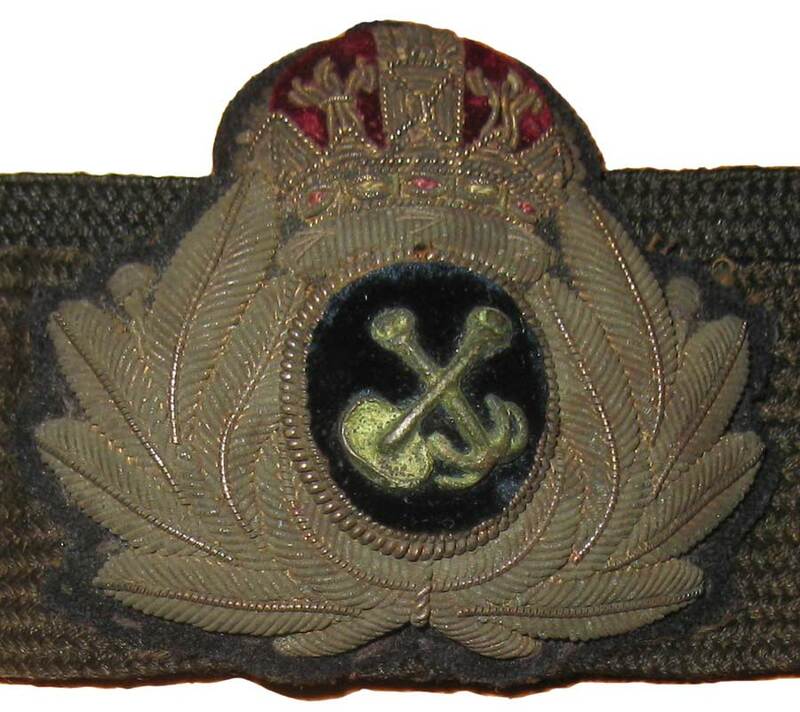 The motif on the badge and buttons is a combination of a drag anchor and a mushroom anchor, both used when recovering cable from the seabed for repair. 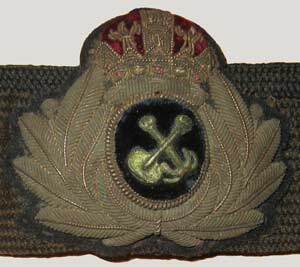 Thanks to site visitor Bruce Mai of Auckland, New Zealand, for providing photos of these items from uniforms worn on HMCS Iris, which were given to him by Doreen North of Titirangi, Auckland, the daughter of Captain Hughes. Roy Peck sends a story about his father’s attempt to catch up with CS Recorder (2), published in the Melbourne Sun, 22 April 1938. 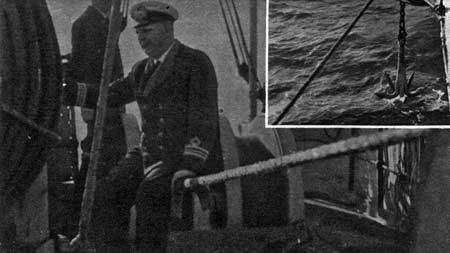 In those days before scheduled airline flights, it was no easy matter to find a cable ship out on repairs. A ship’s engineer without a ship, Mr. F.H. Peck has chased the cable ship, Recorder, 10,000 miles and is still seeking her. He had intended to continue his quest on the Morinda, but that vessel is to be docked in Sydney. The Recorder is temporarily at Norfolk Island, and Mr. Peck fears he might arrive too late. Mr. Peck is an engineer with the Eastern Extension Cable Co. He was on the Recorder, but was temporarily transferred to the company’s ship Mirror, engaged in cable repair work in the Red Sea. He returned to London, and left there early in February to join the Recorder once more. But working on cable repairs, the Recorder had no regular run, and Mr. Peck has found that wherever he goes, he just misses the vessel. The Morinda is the only vessel to call at Norfolk Island and Mr. Peck can only wait for it to be repaired. Matt Hope-Ede’s great-grandfather Harry Anderson sailed on five expeditions on HMCS Iris between 1913 and 1915, all under Commander W.R. Holmes. The voyages originated and ended in Auckland, and Anderson served as A.B. and Bos’n’s Mate. Born in Pymble, N.S.W., Australia, in 1895, Anderson was living with his family on Norfolk Island at the time of his cable service. 1939 While attempting a repair near Batavia Recorder was caught without navigation lights in territorial waters by a Dutch submarine and was requested to accompany the submarine into port. Holland was at this time still neutral. Fortunately everything was sorted out and Recorder was able to carry out the repair. 1941 Undertook the diversion of one of the Bombay-Aden cables into Muscat. This involved the recovery of 560 nm miles of cable at a pick up rate of 1 nm per hour. In all, three trips were involved. “Cable” is the name popularly given to telegraph messages which are sent over wires which lie on the bed of the ocean, Before the introduction of the radio telephone, the cable was the only method of sending messages round the world in a few hours. The cable ships lay new cables and repair any breakdowns. Inset: By means of a very delicate instrument on board it is possible to tell when the ship is over a cable. 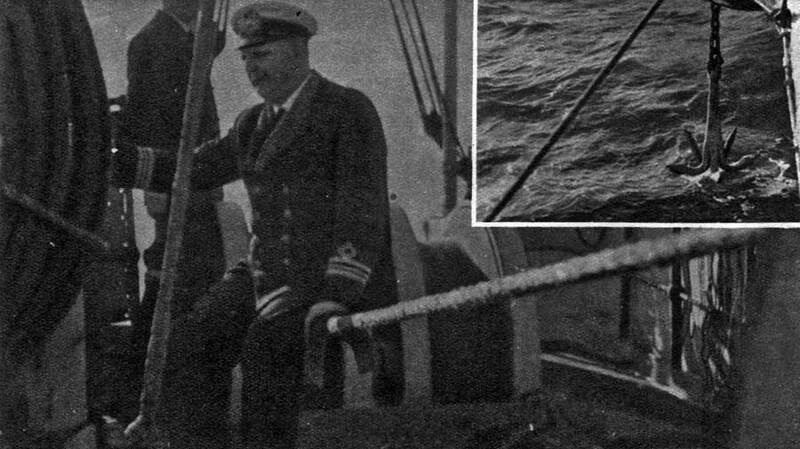 Here the chief officer lays a course across a cable. Raising the cable from the bottom of the ocean. The grapnel, to haul the cable to the surface, goes down over the bow sheaves. An officer sits on the hawser attached to the grapnel. By the “feel” of it he can tell when the cable is fast on the grapnel. The grapnel is then hauled up, bringing the cable with it. Inset: The grapnel, with its four large hooks being lowered from the ship to the bottom of the sea.